We are focusing on the THAP domain, an evolutionary conserved protein motif previously identified in the team of Vascular Biology (J.P. Girard, IPBS), which defines a large family of zinc-coordinating proteins, linked to cell proliferation and cell cycle control. The prototype of the family is the human THAP1 protein that is a direct modulator of the Rb/E2F target cell-cycle regulating genes, such as RRM1. THAP1 has recently emerged as the cause of DYT6 primary dystonia. In order to understand the rules governing specific DNA – protein interactions within this family, we investigate the structural and dynamical properties of THAP domains from human proteins when bound to DNA, using a combination of biophysical technics (NMR, fluorescence, calorimetry..). Several members of the family such THAP1 and THAP11 are currently being studied. Left, NMR structure of the THAP domain of hTHAP1 bound to its specific rrm1 DNA target (Nucleic Acids Res., 2010); middle, ITC thermodynamic profile of the THAP-rrm1 interaction right (Nucleic Acids. Res., 2012), NMR solution structure of the THAP domain of human THAP11 (J. Biomol. NMR, 2013). NMR is a powerful for the development of ligand binding to protein targets of pharmaceutical interest. One particularly suitable approach is fragment based ligand screening which uses the capacity of NMR to detect binders of low affinity such as small fragments following the “rule of 3” by Oprea. As a member of the PICT facility (Genotoul – Ibisa national facility for ligand screening and development, certified Quality ISO 9001 since July 2012), we are using STD-NMR, water Logsy, trNOE and chemical shift mapping to characterize ligand – protein interactions. Extensive molecular simulations are performed by J. Czaplicki, such as ligand docking, molecular dynamics simulations and quantitative analyses of transferred NOEs. 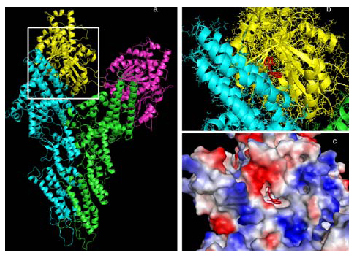 Virtual screening results of a complex mimicking the gamma-tubulin small complex: 2 gamma-tubulin molecules (yellow and magenta) and 2 GCP4 (blue and green, based on the GCP4 X-ray structure). Several ongoing projects involve the PICT platform and the X-ray team of the IPBS headed by L. Mourey: DNA repair (coll. P. Calsou, IPBS), the TFIIH transcription factor (coll. A. Mari, IPBS), Tubulin gamma TuRC (coll. A. Merdes, CBD Toulouse) and Sphingosine kinase 1 (coll. O. Cuvillier, IPBS). Biophysics: Fluorescence, microcalorimetry, Differential Scanning Fluorimetry. Structure calculations: CNS 1.2, ARIA 2.0, HADDOCK, AUTODOCK, VINA Computing cluster 250 cpus. Campagne, S., Muller, I., Milon, A., and Gervais, V., Towards the classification of DYT6 dystonia mutants in the DNA-binding domain of THAP1, Nucleic Acids Res. 40, 9927-9940, (2012). Campagne, S., Gervais, V., and Milon, A., Nuclear magnetic resonance analysis of protein-DNA interactions, J R Soc Interface 8, 1065-1078, (2011). Campagne, S., Saurel, O., Gervais, V., and Milon, A., Structural determinants of specific DNA-recognition by the THAP zinc finger, Nucleic Acids Res. 38, 3466-3476, (2010). Bessiere, D., Lacroix, C., Campagne, S., Ecochard, V., Guillet, V., Mourey, L., Lopez, F., Czaplicki, J., Demange, P., Milon, A., Girard, J. P., and Gervais, V., Structure-function analysis of the THAP zinc finger of THAP1, a large C2CH DNA-binding module linked to Rb/E2F pathways, J Biol Chem283, 4352-4363, (2008).